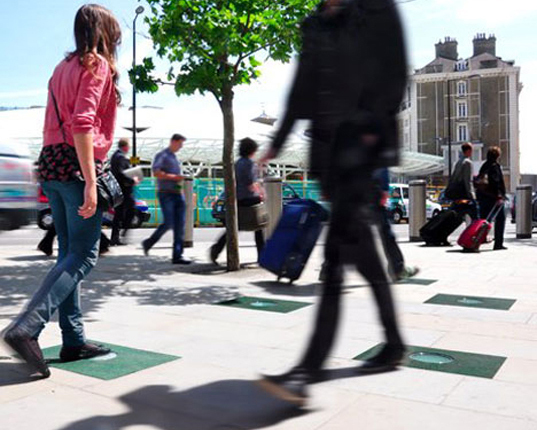 A couple of years ago, we ran a story about Laurence Kembell-Cook's brilliant Pavegen floor tiles, which capture kinetic energy from footsteps and convert it to electricity. Now after two years of product testing and picking up a slew of awards across the U.K., Pavegen has received its first commercial order -- to light up the new Westfield Stratford City Shopping Centre! With nearly 30 million shoppers a year, the Westfield Stratford City Shopping Centre has plenty of foot traffic. The mall plans to install a grid of Pavegens in a main crossing outdoors between the shopping centre and the London Main Stadium, which is known as the heaviest trafficked area. Depending on the walkway’s use, the grid will work its way up to powering the entire mall’s lighting system. The Pavegen floor tiles flex a slight 5 millimeters when stepped on, capturing kinetic energy which is either stored in lithium polymer batteries beneath its surface or converted into 2.1 watt-hours of electricity and distributed throughout surrounding lights. The center of the tile illuminates when stepped upon, not only informing the passerby of their contribution to the environment but also encouraging the continuation of sustainable awareness and decisions. The first designs were aimed at illuminating small spaces like bus stops, ticket machines, refrigerators, and shop signs, but with a large number of Pavegens, the possibilities are nearly limitless. The Pavegen tiles themselves are completely eco-friendly. The entire casing is made of marine grade stainless steel and recycled polymer with low carbon concrete. The top surface is built entirely of old truck tires that are not only a great use of recycled material, but also make the tiles incredibly durable throughout years of weather and wear. Even the manufacturing of the Pavegens is kept within 200 miles of the company’s main office, reducing energy wasted through transportation and assembly. After winning the Big Idea category of the U.K.’s Observer Ethical Awards earlier this year, Kembell-Cook is now in the running to win the Shell LiveWIRE Young Entrepreneur of 2011 Award which would give him 10,000 ₤ to use towards his invention. Lets hope this will bring Pavegen tiles to the U.S and around the world soon. In agreeance with the 'false economy' angle...we only need to remember 6th form physics "energy is not created or destroyed merely converted from one form to another". Given the Stratford Westfield is brand new, the opening line should read "With an expected 30 million shoppers a year". Journalists should not state estimates as fact. It would be nice if the 2.1 watt-hours was better explained: how many people need to be stepping on each tile to generate that much? Is that the maximum with continuous footfall, or a modelled-use figure that takes into account periods when nobody steps on them? What is the lighting KW requirement for Westfield and consequently how many tiles as a proportional of all those deployed would need to be replaced to meet the lighting needs (bearing in mind the different traffic profiles for each location)? I assume this is only for the public areas, and all the retailers' own lighting is not addressed by this? Then there is the apparent double-use of the electricity: it is "distributed throughout surrounding lights" but then the "center of the tile illuminates when stepped upon". Is the lighting-up tile purely for the trial phase, and does that mean that no electricity will be actually distributed anywhere at this point? The hyperbole in the statement that the tiles are "completely eco-friendly" is astounding. The next sentence states they are made from marine-grade stainless steel. So manufacturing steel is suddenly zero-carbon? And while "low-carbon concrete" is better than "high-carbon concrete", it is by no means "completely eco-friendly". And then it seems the tile is a composite of steel, polymer, concrete and truck tyres. So, a bit of a recycling nightmare then. Or does the design make it fully separable at end-of-life? Can the surface be reapplied so the tile can be re-used? None of the real questions that should have been asked have been answered here. The rest of the article follows Pavegen's PR very closely without any real context or challenge. Let me not come across as too down on this, but frequently innovation looks good but doesn't really solve a problem. Sometimes it's even worse than the existing technology. In this case, floor tiles that had a lower full-lifecycle environmental impact would be a good thing. But if the manufacturer thinks that the problem addressed here is generating low-carbon electricity then the 2.1 watt-hour contribution, even multiplied across the entire floor area would be only a fraction of needs when you take into account the building standards that spaces like these must comply with. Another thing that I assume the trial will give feedback on is the soft-floor effect, whether this has an impact on people who walk with sticks or who use wheelchairs, and whether people might actually *avoid* standing on these tiles. Unintended consequences often arise. But is lighting the big energy issue with shopping centres? Taking out just one escalator would save more energy than these floor tiles would generate. Reducing heating or cooling by 1C would save vastly more energy. These are things that could be done now, but typically aren't. So if they were serious about environmental impacts, behavioural change that costs nothing would seem to be a more useful priority for Westfield. OK, so looking at the bigger picture, 2050 targets mean that every part of everything must be radically redesigned, but I suspect that data would show the best contribution a floor can make is to be made from low energy materials that are long-lasting and require little maintenance (cleaning chemicals, repairs, etc). Adding complexity is a recipe for higher maintenance which could negate any expected benefit. It would be interesting to see, micro-generation aside, whether these tiles have a lower LCA impact than regular ones. I agree that making walking more tiring could make people fitter, I otherwise completely disagree with Guerojose's points. First of all, it's a fallacy to claim that we use energy walking, so tapping some of it makes no difference. This is akin to claiming that both a large 4x4 and a small car use energy, so it makes no difference which we buy. Secondly, the situation is different from running shoes which aim to store energy then release it back to the runner. These tiles aim to steal energy without giving it back. If the walker doesn't notice, then this is only because the quantity of energy harvested is so puny. This can make walking significantly more tiring - just try walking 5 miles on a mountain or 5 miles on a paved surface. It's much less tiring to walk on a hard, smooth surface. The knock-on effects can be significant. Say for the sake of argument that a cyclist can ride 9 miles rather than 10 before becoming tired. This actually decreases the utility of cycling by 20% because that is the proportional decrease in the area within cycling range. Likewise, if you make walking more tiring, you decrease the distances people are willing to walk and encourage them to use motorised transport to compensate. Time for another back of the envelope calculation... If the entire population of the earth walked on your tiles for an average of 12 hours a day, you would produce 7 gigawatts, or roughly 1/2000 of the world's total power consumption. This is utterly insignificant in the grand scheme of things, and to claim that it is, is frankly misleading. These tiles, used in this way, are frankly 'greenwashing' - they make us feel better about ourselves without doing anything substantial to reduce our energy consumption. If you prefer 'front of the envelope' calculations, it would be interesting to know how long it will take the tiles to generate the amount of energy it takes to make them. Maybe you should use the front of the envelope, instead. If the files are flexing slightly, they may actually make walking less tiring, like a running track or basketball court. Even if there is a slight energy cost, a slightly more fit population has other positive knock-on effects. Walking energy is used anyway, but entirely wasted through heat. The principle of capturing and making use of that energy makes sense. Style over substance. Let's do a back of the envelope calculation. If each of 30 million shoppers spends an average of 2 hours walking round the complex, they'll generate a total of 60 million watt hours of electricity - in other words 6 kilowatts. Enough to power perhaps 500 energy saving lightbulbs, or 24 computers. If it takes 30 watts to walk, these devices probably amount to a 10% walking tax by the time inefficiencies are accounted for. The amount of energy they create is minimal, and they will measurably slow pedestrians slightly, making shopping more tiring. All in all, it's bad environmentalism and probably bad business too. With nearly 30 million shoppers a year, the Westfield Stratford City Shopping Centre has plenty of foot traffic. The mall plans to install a grid of Pavegens in a main crossing outdoors between the shopping centre and the London Main Stadium, known as the heaviest trafficked area. Depending on the walkway's use, the grid will work its way up to powering the entire mall's lighting system. The Pavegen floor tiles flex a slight 5 millimeters when stepped on, capturing kinetic energy which is either stored in lithium polymer batteries beneath its surface or converted into 2.1 watts of electricity and distributed throughout surrounding lights. The center of the tile illuminates when stepped upon, not only informing the passerby of their contribution to the environment but also encouraging the continuation of sustainable awareness and decisions. The first designs were aimed to illuminate small spaces like bus stops, ticket machines, refrigerators, and shop signs, but with a large number of Pavegens, the possibilities are nearly limitless. Last year, Kembell-Cook took his Pavegen design to a local grammar school for a real-world trial period. He installed the tiles throughout one busy corridor to allow the 1,100 students to power the lights with their footsteps. The experiment was not only a technological success, but also engrained the importance of sustainability and renewable energy into the daily lives of the students. The Pavegen tiles themselves are completely eco-friendly. The entire casing is made of marine grade stainless steel and recycled polymer with low carbon concrete. The top surface is built entirely of old truck tires that are not only a great use of recycled material, but also make the tiles incredibly durable throughout years of weather and wear. Even the manufacturing of the Pavegens are kept within 200 miles of their main office, reducing energy wasted through transportation and assembly. After winning the Big Idea category of the U.K.'s Observer Ethical Awards earlier this year, Kembell-Cook is now in the running to win the Shell LiveWIRE Young Entrepreneur of 2011 Award which would give him 10,000 pounds towards his invention. 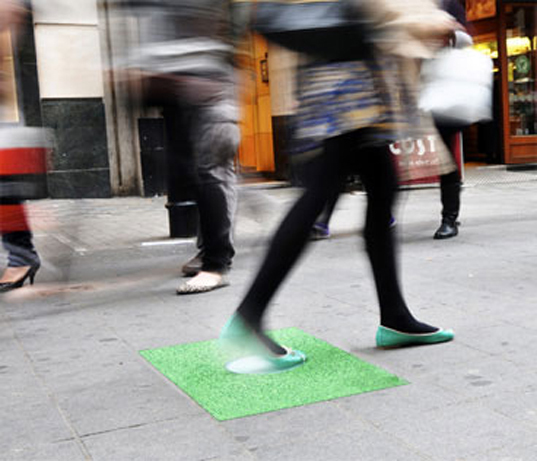 Lets hope this will bring the Pavegen tiles to the U.S and around the world soon.